Welcome to Day #2 of Chocolate and Surprise Theme Week. It's always a surprise to discover holiday-related chocolates in mid-January. Normally they evaporate by New Year's Day. However, chocolate and gingerbread are favorites here, all year long. Today's Limited Edition Gingerbread Milk Chocolate Truffles were created by Lindt and Sprungli (Switzerland), and distributed by Lindt and Sprungli U.S. (Stratham, NH). 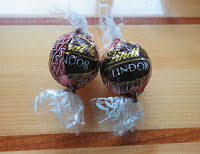 These individually-wrapped, round milk chocolate gingerbread truffles were tasty and satisfying. 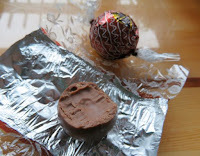 The fillings inside the milk chocolate outer shells were creamy and smooth, and flecked with tiny crunchy bits. The gingerbread flavor was subtle and authentic. Note to those who avoid gluten: These truffles did contain barley malt powder.